How would you spend the ultimate summer day in Austin with the kids? We recently sat down to think about what we’d recommend to visitors, day-trippers or even locals who want to explore some of Austin’s classic “must-do” favorites. Breakfast tacos, swimming, cold treats, bats! Yes, indeed! 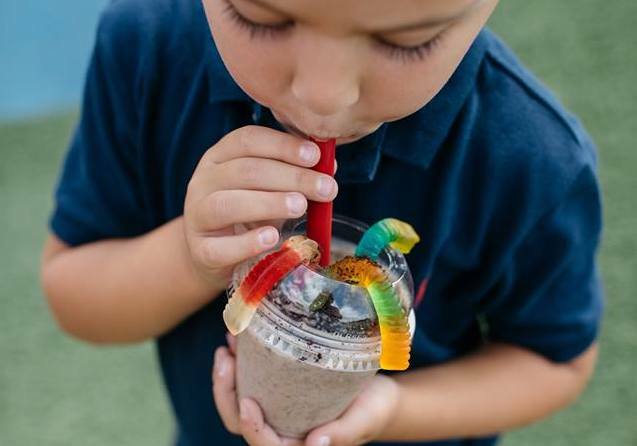 With our friends at Hat Creek Burger Company (who make it easy to grab great food and go adventuring), we present our suggested itinerary below for ways to spend the perfect summer day in Austin with the family! Morning: Rise and shine early to get out and beat the heat on a family hike! There’s nothing better than greeting the day with a nature walk and some fresh air. Keep things simple for your morning routine and order breakfast tacos online from your local Hat Creek. You can simply drive-thru for your take-out and head out on your way. 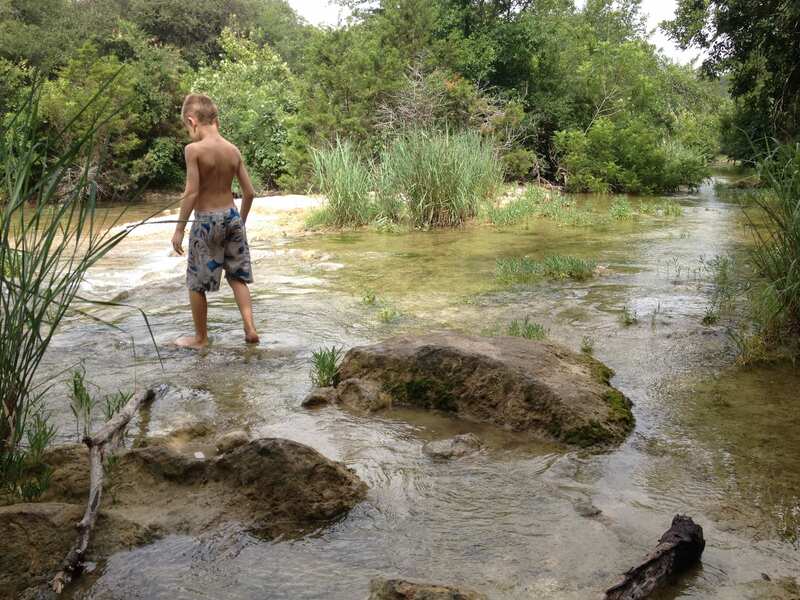 We’re personally fond of exploring the Barton Creek Greenbelt with our kids, but you can also check out this list of 10 Best Hikes for Families in Austin for some more options. If hiking isn’t in the cards, pack up breakfast and enjoy a picnic at one of Austin’s Best Playgrounds. After some time outdoors, you’ll be ready to cool down and go for a swim! 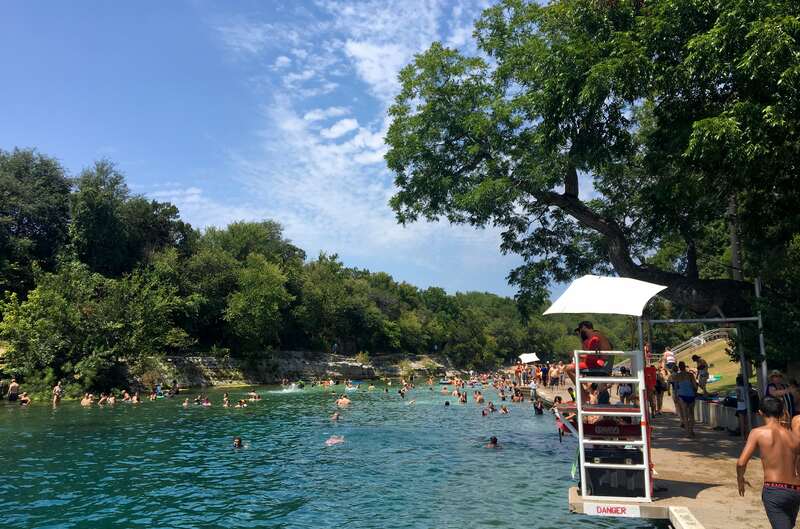 Check out Austin’s most famous and popular swimming hole — Barton Springs Pool! Located in Zilker Park, “the crown jewel of Austin”, Barton Springs is a 3-acre crystal clear natural spring that stays an average of 68 degrees year round, making it ideal for the really hot summer days. It comes equipped with diving boards, a large shallow area, big grassy shores, public restrooms, and several lifeguards. Take note that the pool is closed on Thursdays for cleaning. Click here for hours, entry fees, and any updates. Zilker is an awesome park that offers much more than the pool. For more ideas, check out our list of 100 Things to Do in Zilker Park. If Barton Springs isn’t your ideal swim spot, no worries. We’ve put together a big round-up of Awesome Pools and Splash Pads for other places to refresh. Afternoon: After getting some lunch at one of Austin’s many family-friendly restaurants, such as Hat Creek, you must be ready for some air-conditioned fun. 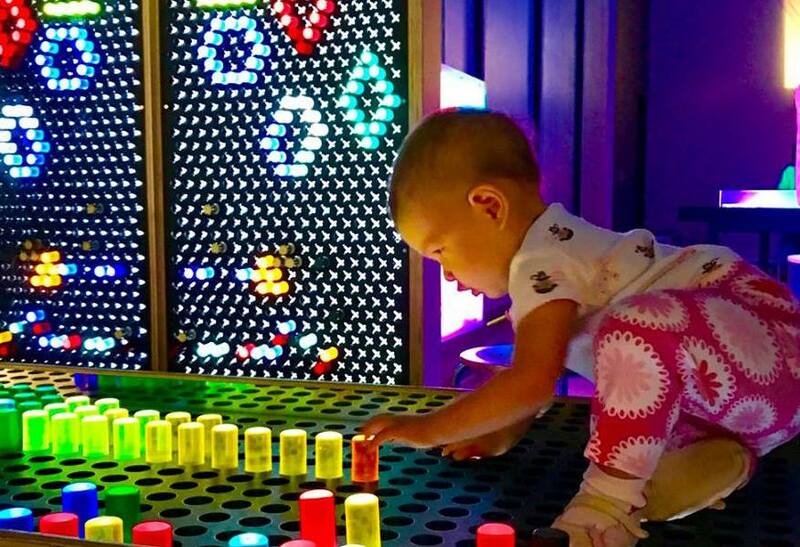 We’d suggest a visit to the Thinkery, Austin’s museum for kids. A place where science and families play side by side – kids can explore tons of hands-on exhibits, play in a pretend market, enjoy indoor water play, experiment in their kitchen, play in the colorful light lab or climb in their backyard. Click here for Thinkery’s hours and admission rates. For other museum suggestions, check out our list of Top 10 Austin Museums for Kids. By now you’ve probably worked up an appetite for a nice sweet snack. What’s better on a summer day than ice cream? Maybe a milkshake or snow cone or popsicle? Either way, time to consult our list on Where To Get Cold Treats in Austin. Evening: After you enjoy a dinner (and maybe a nap), there’s plenty to do once the sun starts to set and the air gets (slightly) cooler. Austin is home to a lot of fun outdoor movie nights and concerts, such as Sound & Cinema, Movies in the Park, or Blues on the Green. Check the Do512 Family calendar to see if there’s something playing! However, we can’t end an Austin summer adventure without a visit to see the famous bats! 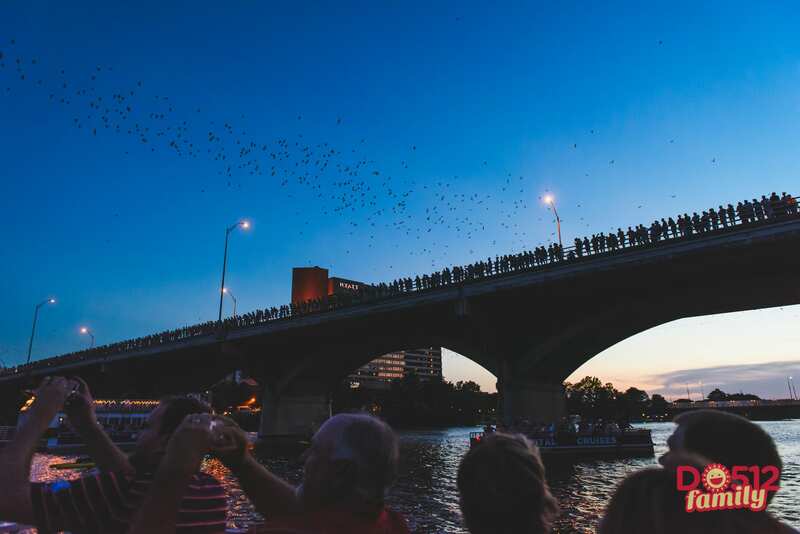 Austin is home to the largest Mexican free-tail bat colony in North America, and we love to celebrate these winged creatures that dwell underneath the Ann W. Richards Congress Avenue Bridge. Seeing the bats swoop out from under the bridge is quite an amazing site! Typically, late July and early August is considered “peak season” to see a spectacular bat show, and we think seeing them from the water by boat is the way to go. Read about our experience aboard the Lone Star Riverboat Sunset Bat Cruise. Click here for the schedule and ticket info. Obviously, there are a multitude of other “true Austin” adventures for families. We’d love to hear how you’d suggest spending the perfect summer day with the kids? Do let us know in the comments below. One thing is for sure, we really do enjoy visits to our local Hat Creek for summer family time. Whether we’re in for Tuesday Family Nights, meeting friends for $1 beer & wine nights on Thursdays, or grabbing food to go on the way to the lake or park, it’s a perfect summertime destination. You can even book a party at Hat Creek for a stress-free gathering. This giveaway is now closed and our winner has been notified. Congrats to Martha K!